This is a meatless dish served in the Mediterranean and the Middle East. Normally Falafel is served with pita bread and with a yogurt sauce. This recipe eliminates the bread and replaces the yogurt with the more healthy and flavorful tahini (see Tahini recipe). Refrito: In a skillet with 2-3 tablespoons olive oil, sauté ½ clove of garlic (minced), ½ onion (minced), ½ teaspoon curry, and a pinch of salt and pepper. This “refrito” along with the tahini will give the garbanzo paste its characteristic flavor. 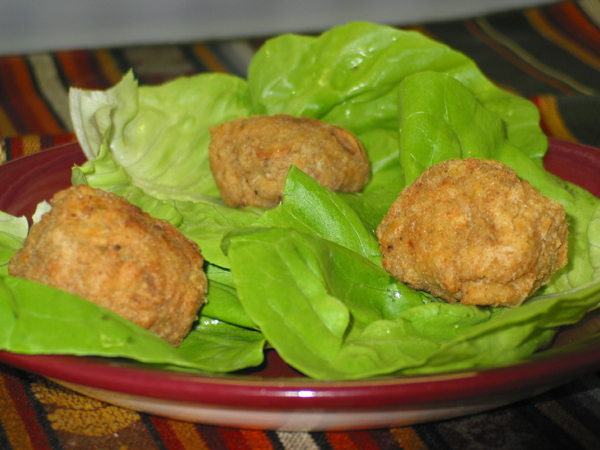 Serve each ball or patty with Tahini, wrapped in a lettuce leaf. Mmmmmm good! It’s delicious with flatbread or pita too!